I have been keeping a journal since I was 9 years old. In fact, we were recently cleaning out our office/guest room/workout room/storage room in an attempt to make it only a yoga room (ha!) and we found a big long tortilla box full of my old journals. 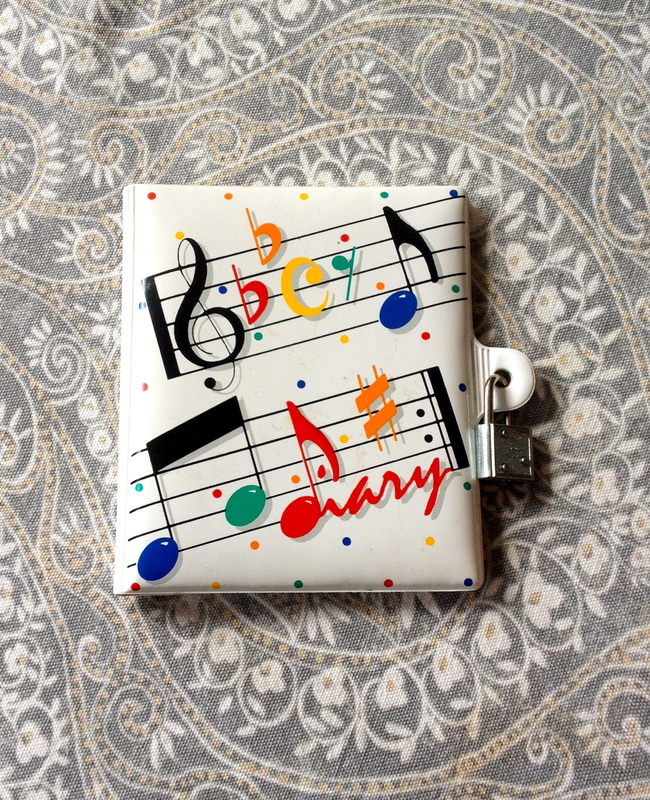 My toddler wanders into the chaos and finds the book that appeals to her the most – a white puffy plastic number with musical notes and polka dots, locked to keep out prying eyes of parents and siblings. Oct. 27, 1988 Today we had a wild day. First we went to since (science?) then we had math then 10:35 recess then came daily oral language and then we played “password” then came lunch. and I have this real big crush on this boy named Joey. We all ran after Joey today to try to kiss him then at 2:00 recess we spyed on Joey. 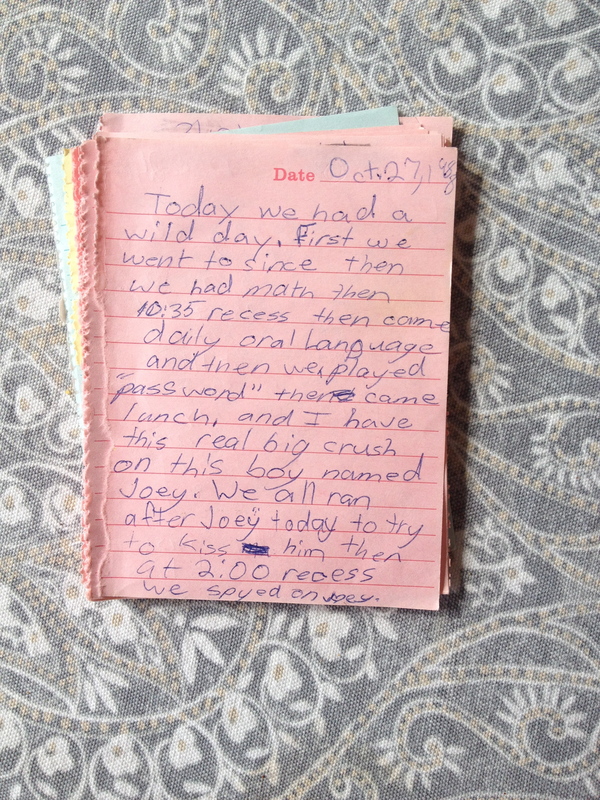 What is “daily oral language?” and did I have another class called “daily written language?” Clearly I could have used a lesson in run-on sentences. My point with this anecdote is to prove that I have been chronicling my thoughts, feelings and not-so-major happenings in my life for 25 years. So I thought that of course I would be all over writing about Baby Bell’s adventures in growing every day. I mean, just take 5 minutes, right? I literally have filled out 3 days of that book. And now the kid is 635 days old (give or take a whole bunch of days) and I feel like it would be weird to try and pick it up again at this point. Thank goodness for iPhone cameras – if a camera were not always in the pocket of my husband, my mother in law or me, then there would be no recorded history of this child. I have already promised myself that I will totally write it all down with the next kid. So that is one of my goals with this blog – to be better at recording these moments. And though I still love the idea of my daughter as a grown woman, cleaning out my old dusty attic after I’m gone and happening upon her baby book where I lovingly recounted the first time she rolled over or cut a tooth or pooed on me, that’s just not the reality. We live in an online world, where our baby books are blogs, our photo albums are Instagram, and our pen pal letters are Facebook. Truth be told, I am kind of afraid the Matrix will happen and all this digital, Cloud content will either just disappear, turning into the thin air from whence my wireless came, or it will take our weak, 140-character minds over and rule the world. But hopefully, all of this will never go away (like that photo someone tagged you in when you were drunk at that party) and my girl can access these archives on the internet database in her brain that she controls by blinking and twitching her head back and forth. Yes, in my vision of the future, the next incarnation of Google Glass is individuals walking around with serious body ticks to surf the web implanted in their brains. So, the other day, Bell was eating rotini noodles with tomato sauce and I was sitting next to her at the table. I noticed that she was just swallowing them straight down, whole. She seemed fine with it, but it made a sympathy lump in my own stomach. So I tried to “teach” her how to chew (though she has no problem doing this instinctually with other foods.) I don’t know how much of a learning or growing moment this was for her, but her imitation of me was pretty darn funny. She has most of her teeth at 21.5 months, but not the middle ones between the front 4 and back molars. She says “cheese!” when we brush her teeth at night. She calls me “Baba” instead of “Mama” – she may be doing this just to spite me. But I do think it’s pretty funny when she yells out, “Hey, Bob!” to get my attention. She can identify some numbers and letters and short words (even Mama with ‘M’s), but is not saying as much as we “expect” her to – I know, I know, kids progress at different rates. She signs “I love you” now and will do it of her own volition, not just when commanded to, and this warms my heart like the sun. She makes a big ole smacking noise when she kisses my cheek. If you ask her what a cow says, she says, “Mooo”, if you ask her what a snake says, she says “Tsssss”, if you ask her what a fox says, she sings the youtube song. This is my fault. I’m kind of sorry and kind of not. 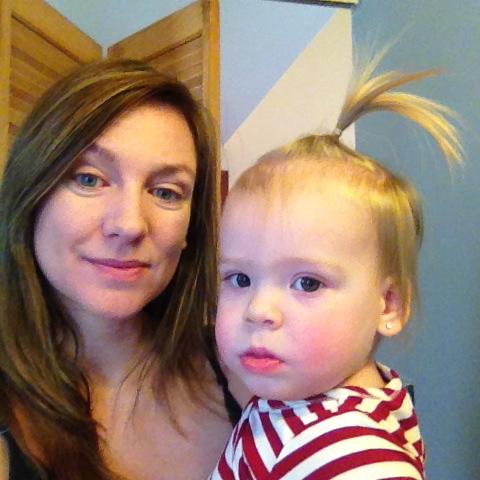 She has only in the last week allowed ponytails in her hair – which is growing naturally into a mullet.